KIGALI – A Rwandan court jailed former justice minister Agnes Ntamabyariro for life yesterday after finding her guilty of incitement during the 1994 genocide. Ntamabyariro is the first senior former government official to be tried by the authorities in Kigali over the killing of 800,000 minority ethnic Tutsis and politically moderate Hutus. She is to appeal. The International Criminal Tribunal for Rwanda had convicted directors of the Rwandan radio station Radio Télévision Libre des Mille Collines (RTLM) of incitement to commit genocide (Case No ICTR-99-52-T The Prosecutor v Ferdinand Nahimana, Jean-Bosco Barayagwiza, and Hassan Ngeze; excellent background summary here), but this is the first such case in the Rwandan courts. 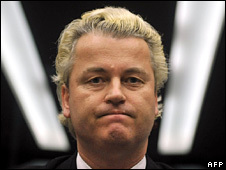 AMSTERDAM – Right-wing Dutch MP Geert Wilders, who has made a short film accusing the Koran of inciting violence, must be prosecuted for anti-Islam comments, an Amsterdam court said yesterday. These cases turn on incitement, but the word itself is entirely neutral. Incitement to do good things would be entirely unobjectionable. It is when bad things are incited that legal issues arise. Given that incitement is an infringement upon freedom of expression, three principles apply. First, the bad things must actually be bad: genocide plainly meets this standard; there is room for debate in contexts such as blasphemy and anorexia; and many spurious grounds lie at the opposite end of the spectrum. Second, where the impugned speech has not yet resulted in the bad thing, then the bad thing must have a high degree of likelihood of actually occurring. From the reports about Geert Wilders, although violence is plainly a bad thing, there does not seem to be a sufficiently high degree of likelihood that his film would incite it (update, and for that reason alone, ‘Wilders must be supported’). Third, where the bad thing has already occurred, the impugned speech must have caused that bad thing. The point of the Ntamabyariro and Nahimana cases is that there was a sufficient causal link between the incitement and the genocide.